While it may be possible that you’re into romantic candlelit dinners with your significant other and boxes of chocolate filled with who-knows-what, some people dream about a holiday that celebrates you and the love you have for your lady friends. If you identify yourself with the latter, Galentine’s Day is definitely something that you should know about. And what better way than to celebrate with endless rosé?! For a limited time, get a pair of tickets to Rosé Picnic 2019 for $50 ONLY until February 15! Get your tickets here before it’s too late! Galentine’s Day is basically the equivalent of Valentine’s Day, but instead of celebrating the love you and your significant other have, it’s about celebrating your best girlfriends who are, at the end of your day, also your soulmates. And who doesn’t want to celebrate and shower their best friends with love on a landmark holiday?! Leslie chooses to celebrate the day of lady love with brunch, but you can choose to celebrate it however you want. Ever since the episode aired back in 2010, it has evolved into a holiday of its own and is just as big a deal as Valentine’s Day. Our favourite way to celebrate Galentine’s Day? Girls night in, of course! The thing about Galentine’s Day is that we celebrate friendship so as long as you are getting your quality time in with your BFFs, there’s no wrong way to do it. Call your girlfriends over and throw an official Galentine’s Day party and get ready to binge watch your favourite TV shows, complete with endless rosé and rosé-based cocktails. We can’t think of a better drink suited for this landmark occasion than XOXO Rosé, available now for $1 off from The Wine Shops! At less than $10 a bottle, you really can’t go wrong with this light-bodied refreshing rosé with flavours of red berry tea, cherries, currants and a touch of spice. It’s (somehow) even better when mixed into a cocktail recipe! Here are a few of our favourite rosé cocktail recipes using XOXO Rosé that are perfect for you and your gals to sip on during your Galentine’s Day party. Part wine, part slushy, this is the ultimate Galentine’s Day cocktail– the frosé. What’s not to love? All you need to do is freeze your rosé wine in advance and blend it up with a few strawberries and lemonade. Pour rosé wine into ice cube trays and freeze overnight. It’s important to note that wine will not freeze like water will, as alcohol doesn’t freeze well. You won’t get solid ice cubes but will get a softer, slushy consistency. Combine frozen rosé cubes with sliced strawberries and lemonade in a blender. Blend until it’s smooth and has a slushy consistency. You may want to stop and stir as needed to ensure the wine cubes are being blended smoothly. Garnish with fresh mint. Serve immediately and enjoy! We guarantee that each sip of this cocktail recipe is sweet, bubbly and refreshing. For your gal pals who are expecting, swap the rosé for pink lemonade and get your movies, popcorn, and face masks ready for this Galentine’s Day ready cocktail of our dreams! In a chilled cocktail glass, add sliced strawberries and ice. 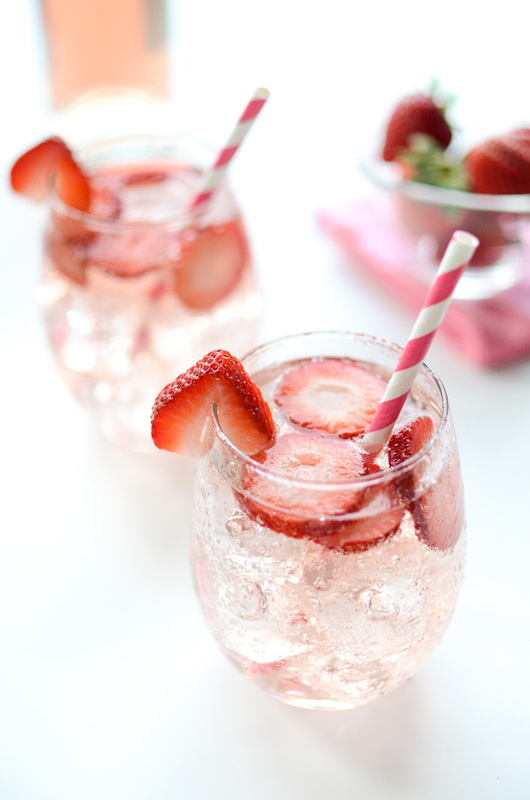 Fill the glass halfway with XOXO rosé and top with a sparkling strawberry flavoured water of your choice. Serve immediately. 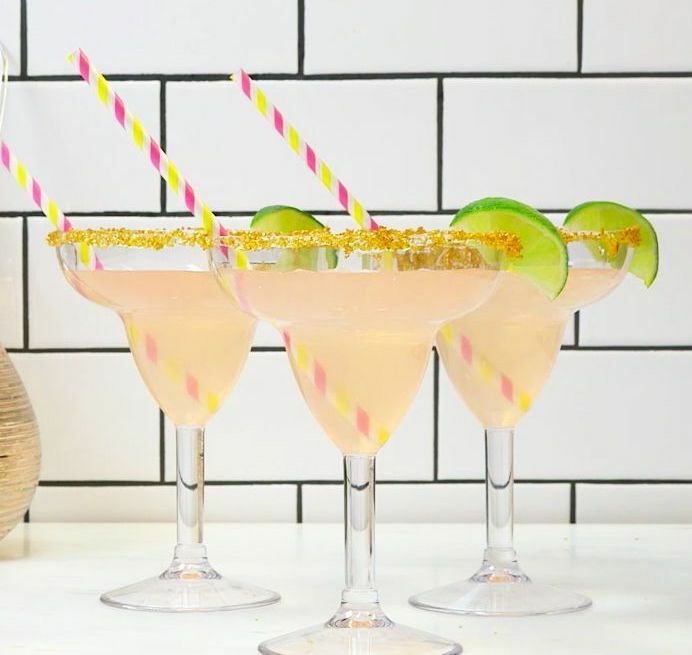 This rosé margarita recipe takes you straight to Mexico with tequila and lime, mixed with refreshing rosé that makes it perfect to sip and serve with your best gal pals at your party! In a large pitcher, combine simple syrup, lime juice, tequila, and rosé. Add ice, sliced lime, and stir well. Pour into salt-rimmed glasses and serve.